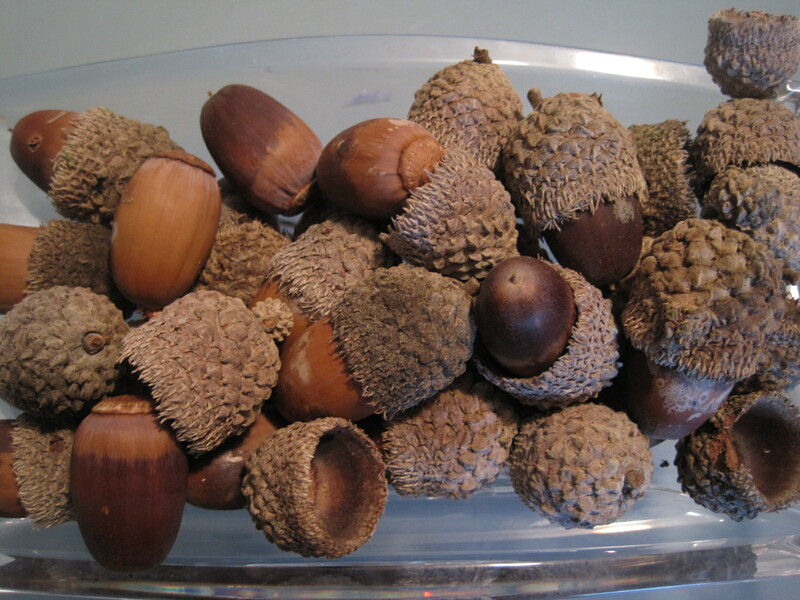 In the park behind our home is a massive oak tree that has the most awesome acorns. I collect them every year for the table during November. 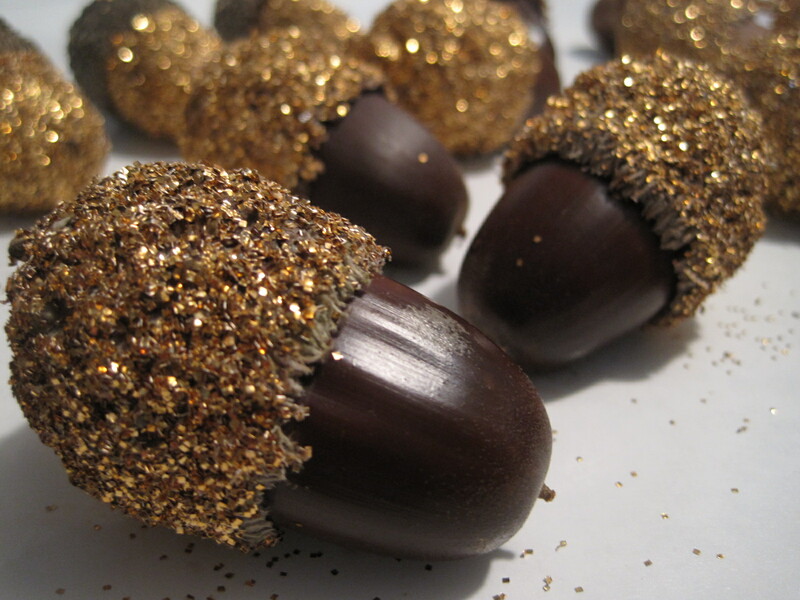 This year I thought how about adding some sparkle (aka glitter). For some reason I thought today would be a good thing to do it, probably because I was done cutting (I cut out 4 more jackets and 15 superhero capes), the kiddo has been acting weird all day (super quite and wanted to wear pajamas, if you know my kiddo you know this is weird!) Kiddo also wanted to do a project with Mommy and I want to get the Halloween decorations down and Thanksgiving decorations up. So why not, let’s get our glitter on, shall we? This is super simple to do, takes about an hour, is messy, fun and somewhat annoying when you realize that this was the wrong day to include the kiddo, but hey the glitter almost matches the carpet! 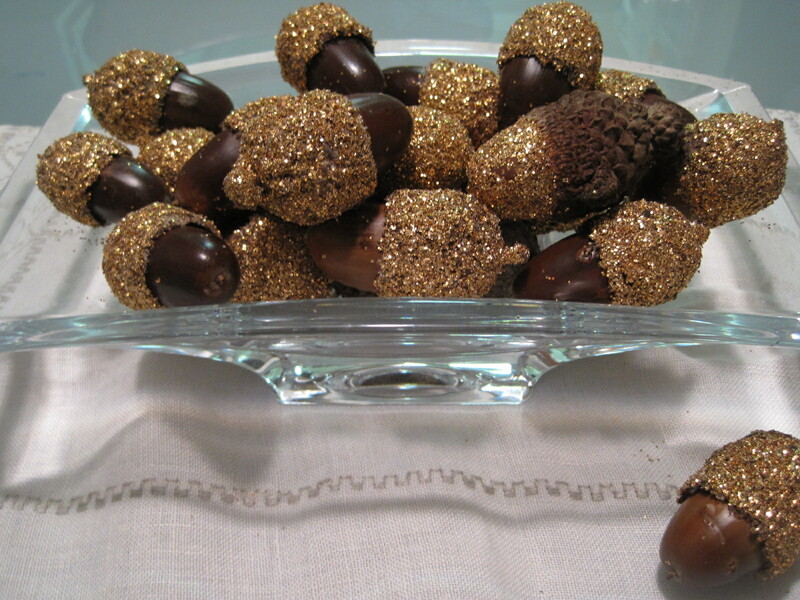 Here is what I used, thrifted vintage glitter in a coppery-gold color, white glue watered down a bit, paint brush, small plastic container and acorns. 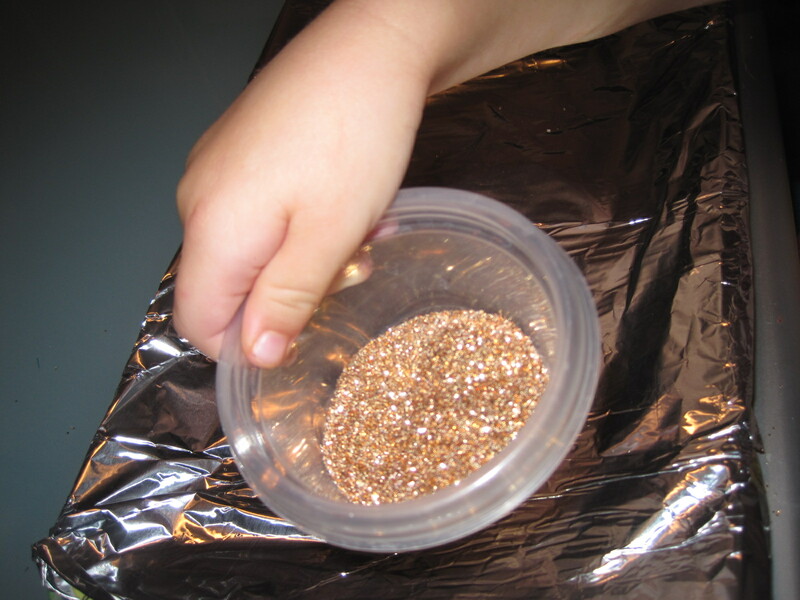 Add some of your glitter into the small container, this is to “help” contain the glitter and “help” little hands keep it somewhat contained. 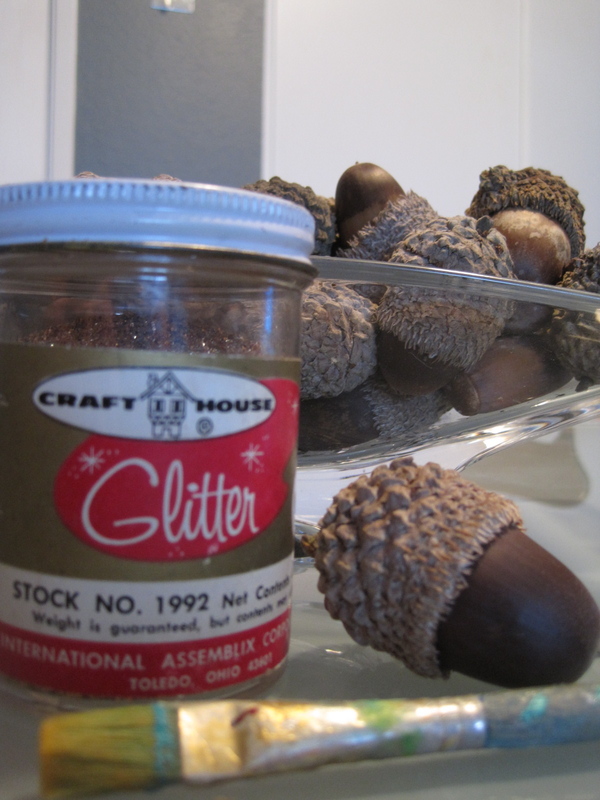 Brush your acorn with the glue mixture. I started off glittering the seed part, but after a few where done, I switched to glittering the caps, I like them much better. 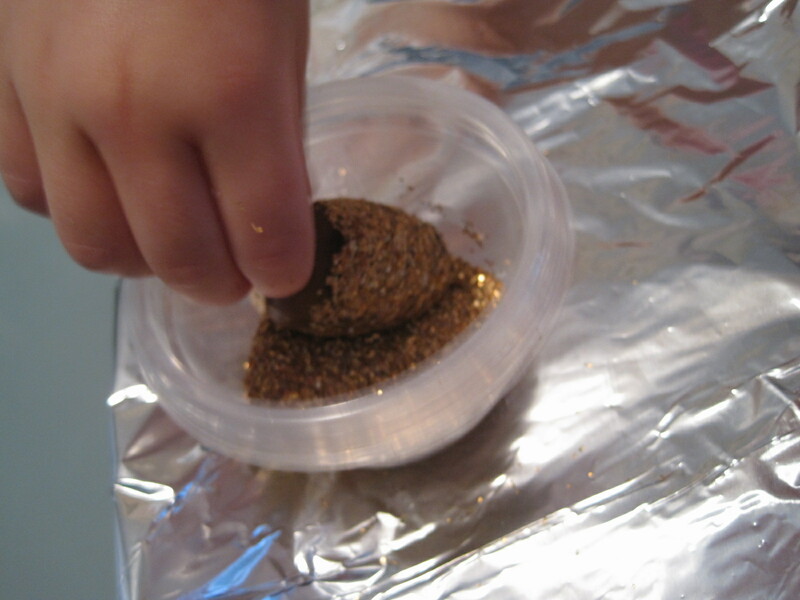 Place the painted seed into the container of glitter and let the kiddo “gently” roll it around to get glitterized. This is where my “containment” plan failed, I think the container I used was a bit to small, one wobble and it was all over the floor. I needed to vacuum anyway. A bit of glue in the cap to stick it back in place, and it’s purrdy. 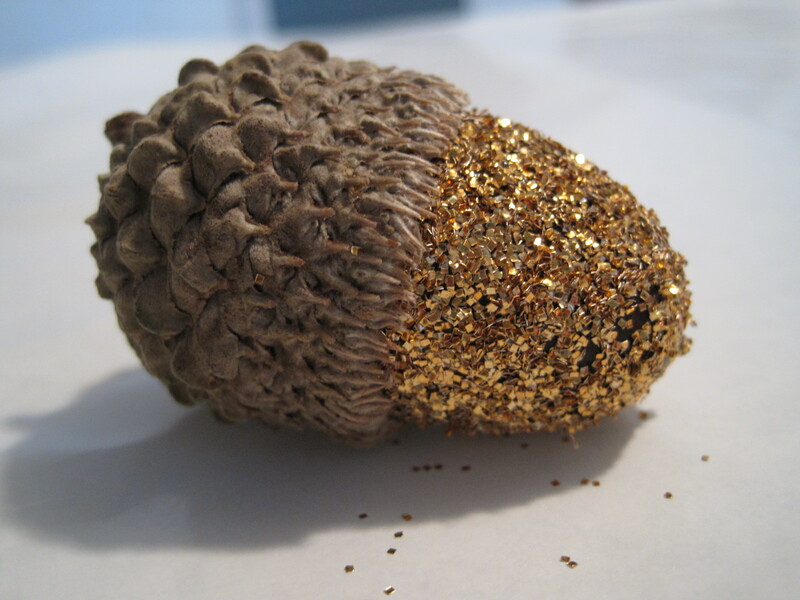 Kiddo and I decided to try glittering the cap of the next acorn and after that she said “Okay Mommy, you can continue doing this, I am going to go to London now to visit with the mermaids.” (okay three and half year old, whatever- quite crafting moment for me). About a half hour later I had finished. Aren’t they cute with the glittered cap? 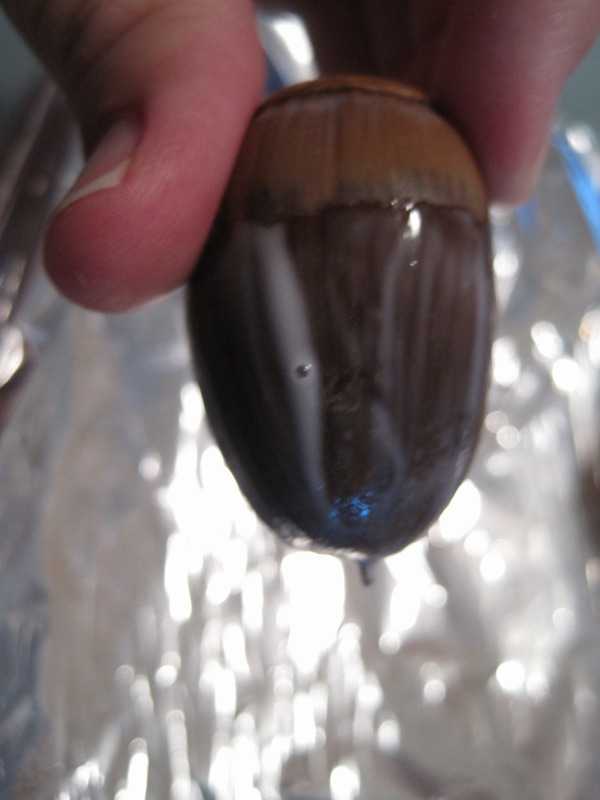 I did end up brushing the seed part with the watered down glue too, it adds a little shine and protects them a bit.